Time to post an underwater image! To be honest, I am not sure how exactly I feel about shark feeds. 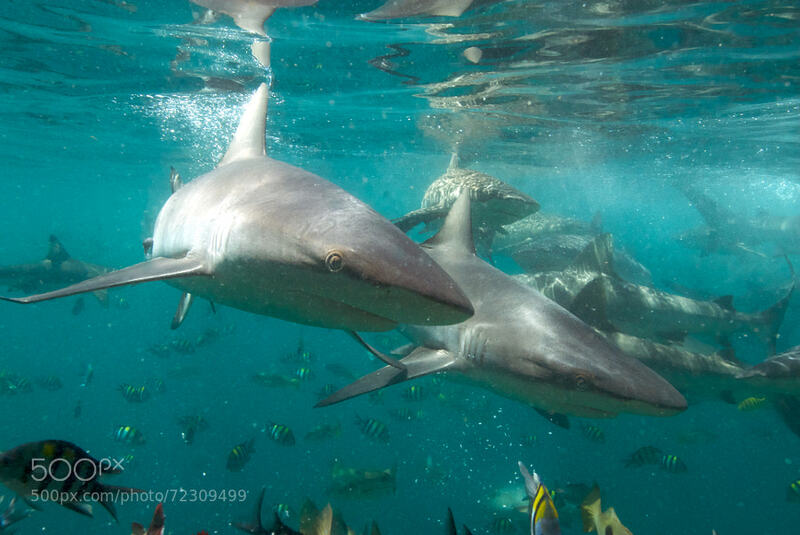 In general, shark feeding can change shark behaviour—making them reliant on being fed at a certain time and certain place, and perhaps on food stuff they wouldn’t normally consume. In the Marovo Lagoon region of the Solomon Islands the shark stocks were almost wiped out by overfishing, namely by fishing boats from Greater China who paid local communities for the rights to fish out the shark stocks. Uepi Island Resort has worked with a variety of conservation groups and the local communities to build awareness of the value of sharks to marine diversity, and the value in terms of tourism dollars. As part of this, Uepi conducts feeds under the pier whereby photographer guests can get in and shoot as I did, whilst eliminating waste food product. The feeds are conducted irregularly, at different times of the day. There has been a noted rebuilding of shark life around Marovo Lagoon. So a shark feed for the sake of an adrenalin rush alone I am against. But when it is being done as part of a concerted effort for conservation purposes I can support. I did enjoy the adrenaline rush, but I also have to say that I was honoured to have the chance to document the experience. Photographically this was a tough gig—the water was already a little cloudy on the day. Throw in the food stuff and a bunch of sharks to stir things up, and it made for quite a challenge. I was under the pier snorkelling, with the pier itself affording some protection from curious sharks (they were never aggressive). Meanwhile Belinda was on the pier above me with another camera. As they were both time synced, it was interesting to see the sequence of shots—in some cases Belinda and I made shots of the same ‘action’ from above and below.